George Papakyriakopoulos is a Program manager and advisor on location-based strategy development with experience focused on digital business transformation in some of the largest international private and inter-governmental organisations such as Dow Chemicals, Google, Deloitte Digital and the World Bank. He has been involved in projects such as the digital business transformation of Syngenta AG and The Global Fund to Fight AIDS, Tuberculosis and Malaria and has led several Google Street Views Projects for the Google SV Special Collects team across the EMEA region. 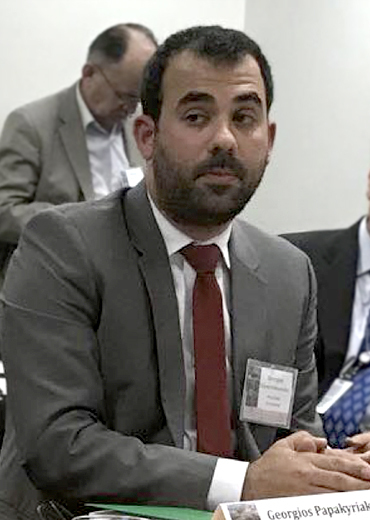 Since 2016, George is working with the World Bank as the Local Project Coordinator of the Technical Assistance project in Greece for the transformation and modernization of the Greek Cadaster, works as an advisor of Governments on the design of National Strategies on Geospatial, as well as private and public organisations and NGOs on digital transformations in Europe and the Middle East. George is a Chartered Surveyor Engineer, holding an Engineering Diploma in Surveying Engineering from the National Technical University of Athens in Greece, an MSc in Project and Program Management from the University of Warwick in the United Kingdom and has completed Postgraduate Studies on Infrastructure Projects at the Swiss Federal Institute of Technology in Zurich, Switzerland.